Bipolar disorder is a mood disorder that sees the client move between two primary moods of depression (low) and mania (high). Clients can also experience periods of stability as well as a mixed state where symptoms of depression and mania occur at the same time. Bipolar I – involves mood episodes ranging from mania to depression. Bipolar II – involves periods of severe depression with milder forms of mania known as hypomania. Bipolar III – a less known type that is linked to the ongoing use of antidepressants that can trigger bipolar. This type is less predictable than type I and II yet still meet the criteria for abnormal mood changes. Cyclothymic – this type is often diagnosed for people who experience at least 2 years of depressive and manic symptoms yet don’t meet the full bipolar disorder criteria. It is considered a milder form of bipolar. Diagnosis can be difficult in bipolar types that show milder symptoms. We all experience times of lows and highs in mood due to various changing circumstances, however, there is usually a pattern that indicates the development of a mood disorder. Some studies suggest that a bipolar diagnosis can take up to 2-6 years due to the complex links and similarities to other mood disorders, mental health issues, and substance abuse. Disorders such as bipolar heavily rely on pharmacological treatment, however, the use of art therapy is integral for clients by providing them with a sense of control especially when pharmacological approaches may be confronting for a client. Art therapy gives the client a direct outlet for their emotional experience. Clients can use art for self-expression without having to rely on verbal explanation with a therapist. 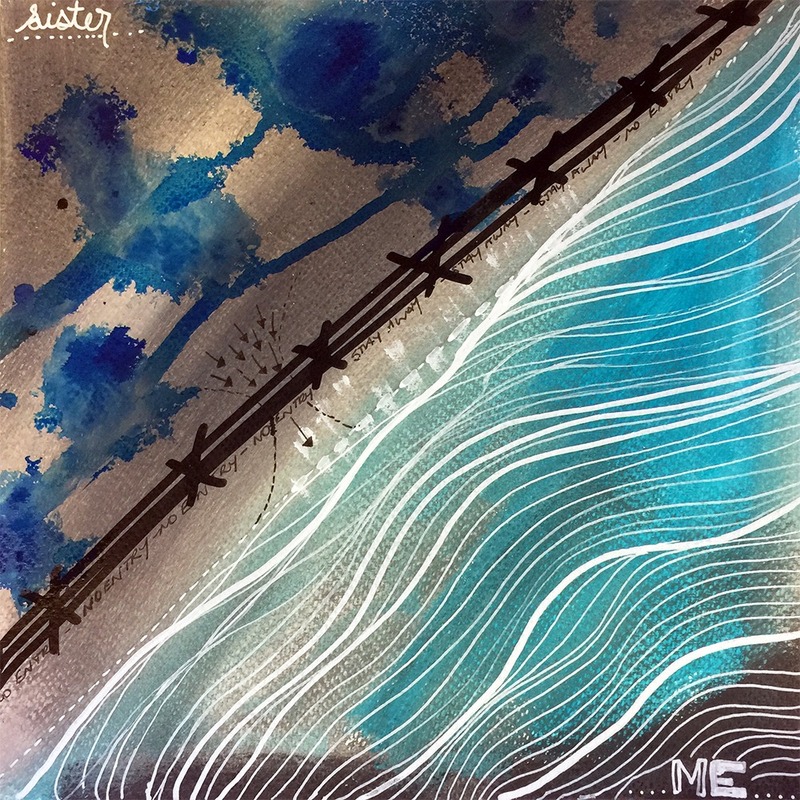 Clients with bipolar can use art as a method stress reduction and develop skills of self-expression that will contribute to their overall self-confidence. Additionally, clients with bipolar can participate in group art therapy which can help develop social skills and widen the client’s perspective on other individual experiences of living with bipolar. Using art therapy with a client who has bipolar should be a non-threatening and inviting activity. Giving the client choices with art materials will help the client develop a sense of control over their therapeutic experience. It is important that the client and art therapist develop a therapeutic alliance that will help the client trust the treatment process. The mood changes for clients with bipolar can be destabilizing. Having a well established and trusted relationship with a therapist will help mitigate the feeling of instability for a client with bipolar. 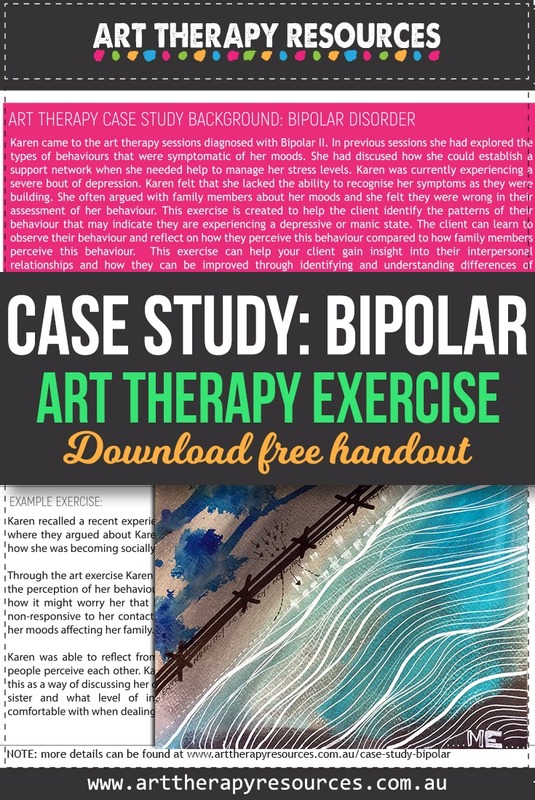 Summary of sessions to date: Karen came to the art therapy sessions diagnosed with Bipolar II. In previous sessions, she had explored the types of behaviours that were symptomatic of her moods. She had discussed how she could establish a support network when she needed help to manage her stress levels. Karen was currently experiencing a severe bout of depression. Karen was currently experiencing a severe bout of depression. Karen felt that lacked the ability to recognise her symptoms as they were building. She often argued with family members about her moods and she felt they were wrong in their assessment of her behaviour. This exercise is created to help the client identify the patterns of their behaviour that may indicate they are experiencing a depressive or manic state. The client can learn to observe their behaviour and reflect on how they perceive this behaviour compared to how family members perceive this behaviour. This exercise can help your client gain insight into their interpersonal relationships and how they can be improved through identifying and understanding differences of perceiving the client’s behaviour. Discuss with your client the type of art supplies they may like to work with in this session. Ask your client to recall a recent interaction with a family member that focused on aspects of their behaviour. Ask your client to portray in their artwork the difference in their view and their family members view of their behaviour. Your client may like to use a piece of paper and divide it in half to reflect the two opposing views. Ask your client to reflect on the differences and similarities between the two sides. Is there a significant difference or marginal difference? Does your client have insight into the perceived differences? Karen recalled a recent experience with her sister where they argued about Karen’s depression and how she was becoming socially withdrawn. 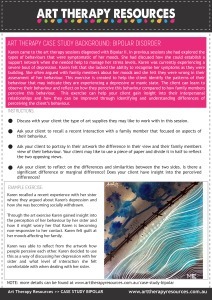 Through the art exercise, Karen gained insight into the perception of her behaviour by her sister and how it might worry her that Karen is becoming non-responsive to her contact. Karen felt guilt at her moods affecting her family. Karen was able to reflect on the artwork how people perceive each other. Karen decided to use this as a way of discussing her depression with her sister and what level of interaction she felt comfortable with when dealing with her sister.